If you’re just getting started inline skating and are looking for equipment that has the quality of Rollerblades without the Rollerblades price, you’re in luck. We researched the best-selling products from some of the best brands available and put together this buying guide in order to help you find the pair that’s best for you. First, let's take a look at some of the things about inline skates that you need to know before shopping for your own pair. Age: We included a pretty big range of different skates on our list. Some are made for kids while others are meant for adults. There are even some that are made specifically for men or for women! Size: Adult skates come in standard men’s and women’s shoe sizes. Men can wear women’s skates and vice versa, just make sure you double check the size. 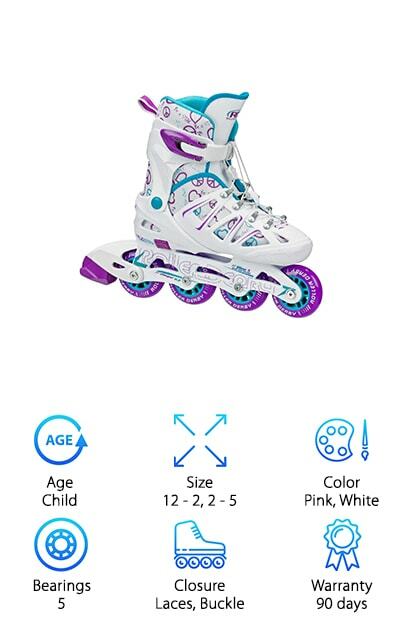 Kids’ skates are adjustable to 3, 4, or even 5 different sizes! Color: Color is one of those things that doesn’t really affect the performance of a skate. That said, if you like pink or blue or if you have a lucky color that you swear makes you go faster, color is important. Bearings: Bearing are really important to skating because they let you turn, spin, and even stop without the wheel grinding. Bearings are rated in odd numbers from 1 to 9. The higher the number, the freer the spin. Closure: There are only a few kinds of closures. Laces give you an easy way to really lock your foot in the boot. Straps and buckles easily adjust and tighten to get the perfect fit. Most have a combination of these. Warranty: The longer the warranty, the better. Most of these products have warranties that are good for 30, 60, 90 days or up to one year. We did find one really great pair that offers a lifetime warranty! Now that we’ve gone into a little more detail about some of the key features of inline skates it’s time to get to our reviews. If you’re in a hurry or running short on time, check out the first 2 items on our list first. They’re our top and budget picks and will give you a good idea of the kinds of products that are out there. Keep reading if you can, the rest of our picks are pretty great, too! Our top pick also happens to be our choice for best rollerblades for kids. We really like that they’re adjustable and have both laces and a buckle. 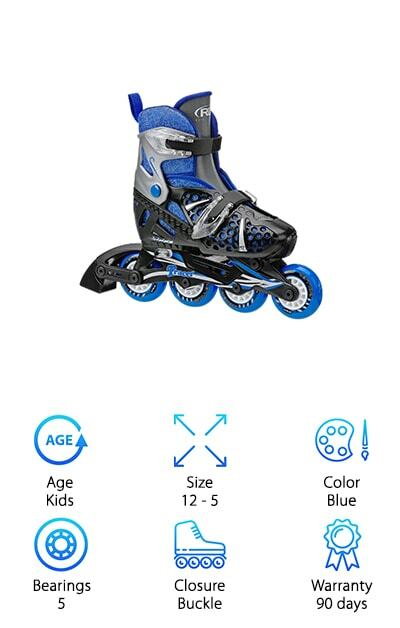 Kids grow so fast and having a pair of inline skates that adjusts to 4 different sizes is definitely something that will come in handy as they grow. One of the things that kids will like best about these skates is the front wheel. It lights up in red blue and green! And get this - no batteries are required. This is more than a fun detail, it’s a safety feature, too, if your child will be skating at dusk or after dark. These skates fit great. The soft ankle padding gives a lot of support and the aluminum frame makes them tough and strong while keeping them lightweight. 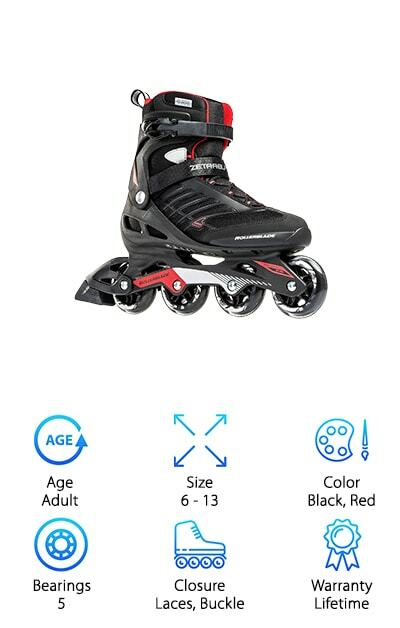 If you’re looking for cheap rollerblades that your kids can learn on, the Roller Derby Tracer is a good skate to start learning on. The soft boot support has a lever buckle that will help your child feel secure in the skate while also being comfortable. The inside of the boot is nice and soft, too, thanks to the comfort grip padding. 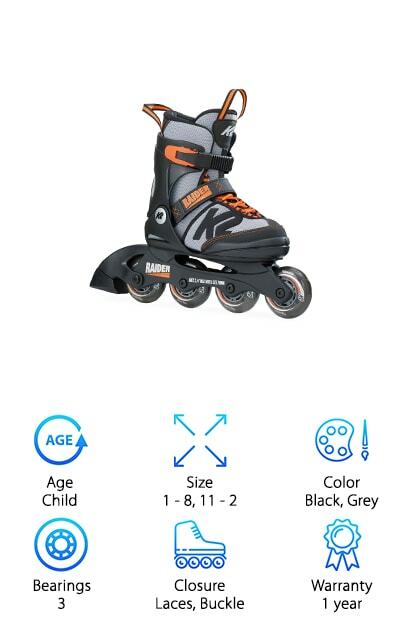 The skate expands with the push of a button so they can grow with your child as they get older. This is perfect because it saves you money in the long run since you won’t have to buy an additional pair of skates. These skates will work anywhere you have a hard surface, whether you’re indoors or out. They’re available in 2 adjustable sizes and are a perfect choice for first-time skaters. One of the things that we really liked about this pair of best street rollerblades is the wheels. Why? Because they’re made of super smooth gel that your kids will love to learn on. These are another great pair for a kid to learn on. They come in small, medium, and large. Each one is adjustable through a few different sizes. All in all, they fit kids with shoe sizes that range from 12 to 7. These skates don’t have any laces, just a simple buckle over the top of the foot and at the top of the boot. Why does that matter? Because it makes adjusting them faster and easier. That’s not all. They’re made of strengthened nylon to extend their lifespan which is perfect since you child could potentially wear them for a long time. 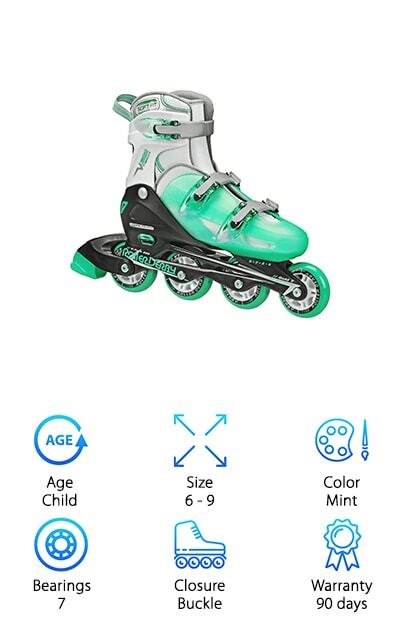 Now that you have a few options for kids, you’re probably wondering if there’s a pair that’s great for you if you’re going to buy rollerblades for the first time. Of course, there is! This is a really good entry level skate that’s perfect for anyone just starting out or who only skates every so often. What makes it so good for a beginner? It’s designed so that the frame and the shell give you a lower center of gravity. This will help you keep your balance and help you with control and stability. They have a high cuff for ankle support, something you really need if you’re putting on rollerblades for the first time. Skates need to be comfortable, too, and these have a padded liner that helps you stay comfortable while you learn. Here’s another pair of best inline skates that’s great for you or an older child to learn on. One of the really awesome things about this skate is it can grow with your teen or pre-teen. It adjusts from women’s sizes 6-9, but there are lots of other features that make this an awesome skate. For starters, the boot has a push button adjustment system to change the size. Plus, there’s a triple- cam-lever buckle that makes it easy to get the right fit and support. You won’t have to adjust the tightness every time you take them off and put them back on again. There’s also a rigid reinforced polymer frame that gives proper support to the foot and ankle. Inside the boot, the comfort fit padding will keep the user’s feet comfortable while she skates. There are plenty of Rollerblades for sale that are ideal for helping kids learn how to skate. The K2 Skate Boy’s Raider is another great example. Like a lot of kids’ skates, these ones adjust in size. But here’s the thing: they adjust 5 sizes! As your child’s foot grows, so will this skate. These skates have both traditional laces and a buckle. The laces go from the toes to the top of the foot and help get feet locked in tight. There’s also a band that across the top of the foot for even more stability. Finally, at the top of the boot is a buckle so you can make some final adjustments to get the fit just right. One more thing: the frame was designed to absorb vibrations, giving your child a smooth ride. 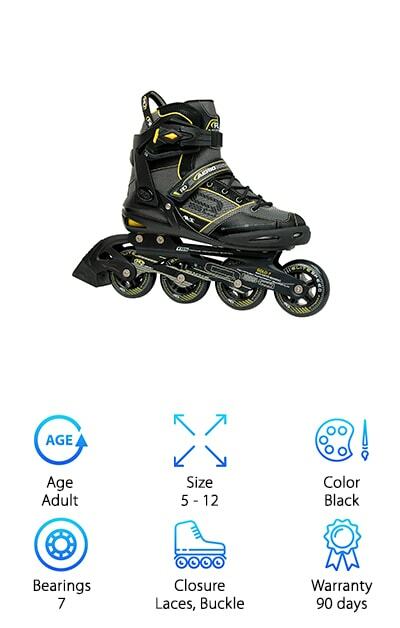 For the best street rollerblade for kids try, check out the Stinger 5.2 from Roller Derby. They offer a lot of support thanks to the molded cuff. They pay attention to comfort, too, and made the removable and machine washable insert soft and comfortable when skating. 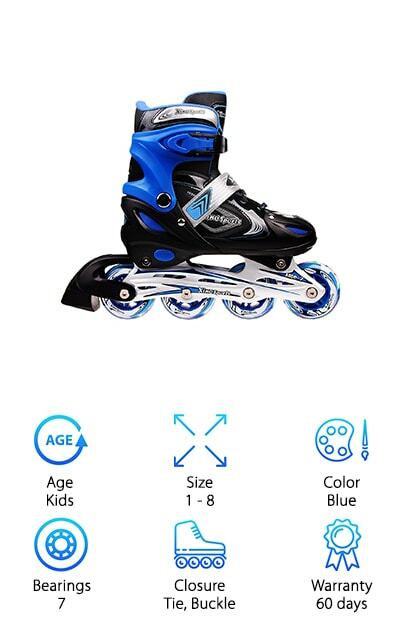 These skates adjust between 3 different sizes and all you have to do it push a button and adjust them. The pull and lace system helps your child’s foot feel snug and firmly in place while the strap around the top of the skate keeps them from flopping around on your child’s legs. Roller Derby has been one of the most trusted skating and Rollerblade brands for more than 80 years. We’re confident that they know exactly what they’re doing when it comes to making quality skates. If you’re looking for the best rollerblades for street use, these Roller Derby AERIO Q-60s just might be exactly what you’re looking for. Here’s one thing that we really love about this pair of skates: they’re super comfortable. Why? Because of the memory foam lining. That’s right, the same type of stuff that your super comfy mattress is made of is what’s lining these skates. The memory foam allows the skate to conform to the exact shape of your foot. You get support and an amazing fit. There are laces over the foot and cam-lever buckles to help you get a secure fit and maintain a good stride while you’re skating. The frame is made of aluminum so it’s lightweight and durable. One last detail, it’s available in 7 different sizes, ranging from 5 to 12. 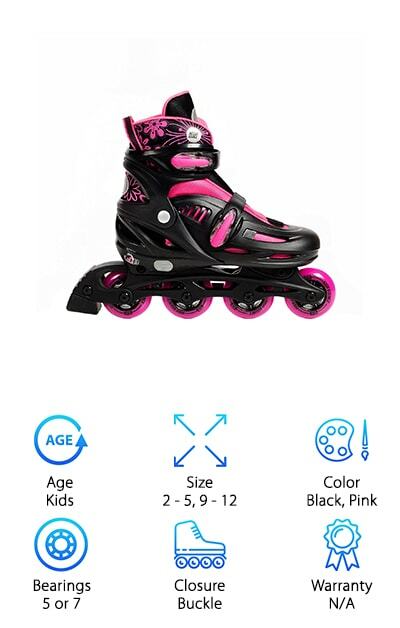 These inline skates from Mongoose are great for kids of all ages. They’re adjustable, too, so they’ll grow up with your kids. The small is for shoe sizes 1 to 4 and large covers sizes 5 to 8. Because they grow with your child over 4 difference show sized, you won’t have to buy a new pair every summer. There are adjustable laces over the top of the foot to help anchor your child’s foot in the skate. Not only that but there’s also adjustable power straps and locking buckles to get a more customized all-around fit. 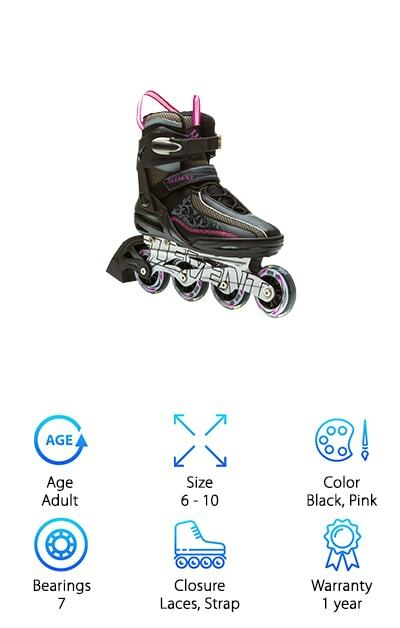 These skates give a smooth ride which will make your child feel more comfortable and confident. 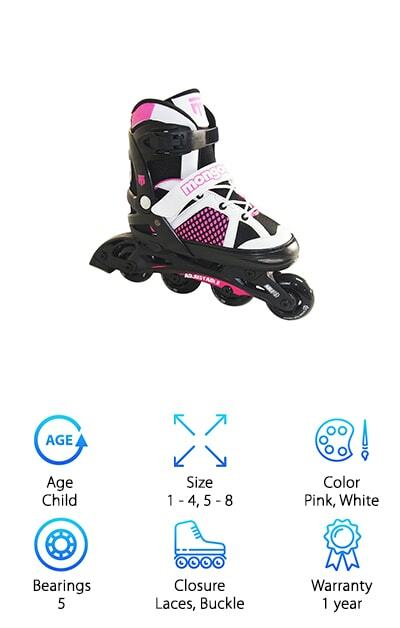 The skates are black with pink and white accents, perfect for the little girl who won’t let anything stop her. The last Rollerblade review is on a pair of women’s skates that are functional and really stylish. The boot and wheels are black with white and hot pink accents. At the top are 2 bright pink tabs to help you pull these skates on more efficiently. The aluminum chassis is lightweight and tough. As for comfort, the soft boot keeps your feet comfortable but there are laces and a buckle to give you even more stability and support. These are a really great pair of skates for someone just getting started. They’re supportive and durable and designed to be used at recreational speeds. Plus, they look sleek and stylish. The boot isn’t as bulky as it is with some other styles and we really like the way the light colors play off of the dark ones.